Volunteering entails taking time off from your busy schedule at work, in school, your everyday life. Know that the time you are willing to commit to volunteering is a priceless gift to our society. It does not matter if you volunteer on a full-time, part-time, or occasional basis. What is important is that you are willing to share a portion of your time for a worthwhile cause. Talk and open up to your co-volunteers and to the people you are going to minister or serve. Communicate your interest in knowing more about them — their experiences, their concerns, their needs, their goals and their dreams. Sincere and meaningful conversations establish trust and confidence, and build bridges of friendship. It is important to know and understand where people are coming from in order to respond to them appropriately. Learning about the predicament of other people will make you more open-minded and more compassionate, less judgmental, and less critical of others. Teach by sharing your experiences, imparting your knowledge, and offering your God-given talents. Share and teach God’s love, compassion, and good news by setting a good example. Remember to keep an open mind and an open heart. Bear in mind the words of the Roman philosopher Seneca: Docendo discimus. It means “by teaching, we learn”. As we commit to teach others, we also prepare to be enriched by them. Reach out your hand and touch people, literally and figuratively. You can connect and speak to another person through the healing power of touch. A gentle tap on the shoulder, a consoling stroke on the back, a friendly hug, and other comforting gestures can convey the message of love, caring, understanding, and acceptance. Touch the lives and hearts of others. Let your life and heart be touched in return. It is said that, “By sharing yourself with others, life begins to find its meaning.” Indeed, one of the amazing joys of volunteering is not just what it does for those we serve, but how our own lives are transformed by the experience. Transform yourself, aid in the transformation of others, and, in your own little way, help transform our world into a much better place. By volunteering, you are given the opportunity to make a positive difference in the lives of others. Let yourself be an agent of transformation. Help in creating an dynamic wave of positive change in our society. Share you time, talent, and skills. Be an agent of change. Be one for others. Be a VIDES volunteer! 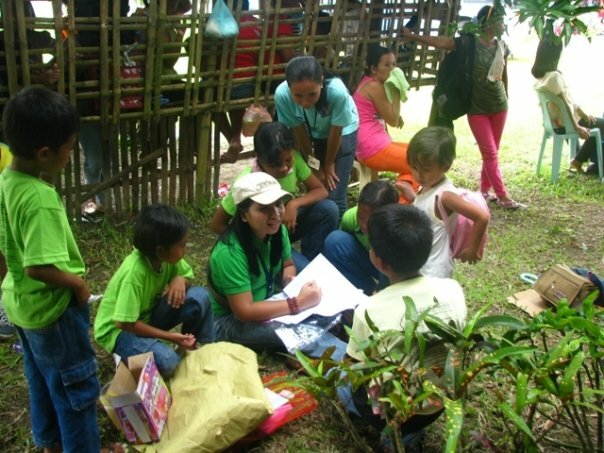 Ciel, an HR Manager in a government agency, has been volunteering for VIDES since 2005. As her contribution to the education advocacy, she has set up "Project Lakbay Aral". The said initiative aims to let underprivileged students and out-of-school youth take the fun and interactive voyage of discovery through visits to museums and other places of historical and cultural significance. In her spare time, Ciel blogs about her adventures at Happy Blue Thoughts.